"When Sir Archibald Latham of the War Office dies from a heart attack while visiting her brothel, Madam India Black is unexpectedly thrust into a deadly game between Russian and British agents who are seeking the military secrets Latham carried. Blackmailed into recovering the missing documents by the British spy known as French, India finds herself dodging Russian agents-and the attraction she starts to feel for the handsome conspirator." India Black, the madam of Lotus House and shrewd business woman, knows how to keep her tarts in line and her customers well cared for. For India it is just another Sunday; an afternoon of bookkeeping and preparing the establishment for another nights business... that is until one of her regular customers mysteriously dies while with one of her employees. Knowing that the reputation of Lotus House will suffer greatly if it becomes known that a death has occurred on the premise, India quickly devises a way to dispose of the body. But when a stranger catches India in the midst the disposal, and offers to help without requesting anything in return, she is immediately wary, for she has learned nothing comes without a price. Despite India's best efforts to return to the normal duties of Lotus House, she finds that it is impossible to do so when spies, assassins, and the British government all want something from you. Thrown into a deadly game of espionage, India must team up with the spy known as French in attempt to thwart the ruthless foreign agents mission and save England from an inconceivable fate. When I first began reading India Black, I was disappointed with the novels pace and plot depth. The first hundred and fifty pages were thick with conversations that did not amount to much, and I found myself wanting to look ahead in order to see when something intriguing might happen. While the plot remained thin, the pace began to pick up speed half-way through the novel. I was extremely pleased when the last hundred pages flew by; the intensity building every time I turned the page. It was during this time that India and French began working together, which complimented the novels newfound pace quite well. Their partnership was a delight and I often found myself smiling at their banter and blunders. Despite the slow beginning and thin plot, India Black was an enjoyable read. The author has shown a talent for creating suspenseful scenarios that grow with great intensity. If she can capture the readers attention with this talent right from the beginning, fans of India Black will be in for some excellent reading adventures. Intrigued by India Black? 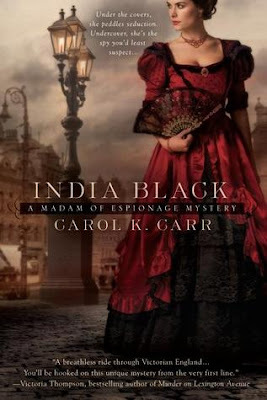 Check out my interview with the author, Carol K. Carr: India Black, author interview.